How Magnum AVL GPS Local Fleet Management Impacts Your Bottom Line | Magnum Electronics, Inc. In today’s fast paced business environment, knowing where your vehicles are provides a competitive edge. If knowledge is power and time is money, even small local fleets can benefit from Magnum AVL fleet and asset tracking. Knowing exactly where all of your mobile assets are in real time or being able to look back anytime during the past 6 months with a couple mouse clicks will make you a smarter organization. You will be able to quickly identify where you are losing money and make corrections faster. 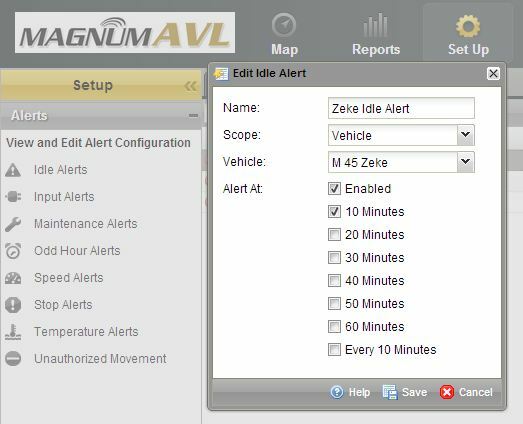 Magnum AVL provides vehicle idle time reports each day, week, month, etc. You can be alerted with an email or text message in real time after a predetermined limit has been exceeded if you desire. The average vehicle burns almost a gallon of fuel every hour so just decreasing idle time can justify the return on investment. Speeding in a lettered vehicle not only uses more fuel but it can ruin your reputation. You can also set speed alerts with Magnum AVL to identify a reckless driver. Fewer miles driven means going to the pump less often. How many miles per gallon do your vehicles average? If your service truck gets 17 mpg, 10 less miles per day will double your ROI. If your mobile assets are remote and don’t start/end the day at your yard this can save significantly more. Magnum AVL can reduce labor and overtime costs especially when there is more than one worker in the vehicle. You will know exactly when your vehicle arrives and leaves the job. Customer complaints about a driver that never showed or was there only a short time can be checked and proven true or false immediately. If you seem to have a chronic overtime problem, Magnum AVL will provide the information needed to identify the cause. Saving 30 minutes of overtime per week can save thousands of dollars at the end of the year. Contact your drivers when they are stopped and not when they should be concentrating on the road. Let your customers know when your technicians are about to arrive at a service call. Know job arrival times without bothering the driver. Also, many insurance companies will provide a discount when GPS fleet tracking is installed. Interested in a Demo, ROI Analysis, or Have a Question? This entry was posted in GPS Tracking, Magnum AVL and tagged fleet management, GPS, Magnum AVL, ROI by magnumelectronics. Bookmark the permalink.